I hope you are all doing well. Recently, a friend asked me how I have changed most over the past few years. My response needed little time for a reply. I have learned how to become happier and experience gratitude. As many of you know, becoming happier is not that difficult; but it does take effort. For me, it was growing my capacity to be more mindful of being thankful while expressing gratitude in my daily routine. Over the holiday break, I hope you are able to relax and reflect on how you have changed the most over the past few years and think of how you wish to grow in the future. Also, at the same time, reminding yourselves that the busy world that we all call student affairs deserves opportunities for us to pause and show how grateful we are toward others, including our staff members in and outside student affairs, students, faculty, etc. I am extremely grateful for all of our volunteers within TACUSPA, which is operated 100% by volunteers with such intentionality and passion. This last conference, which was themed “IT’S GONNA BE BIG,” reinforced our association’s core values of increasing networking opportunities, professional development, and expanding advocacy for the student affairs profession. This past year, we saw the STRONG network of student affairs across multiple institutions come together to support each other and our students when Hurricane Harvey hit the coast. Over the past couple of years our membership has grown and the programs we offer our members are expanding. Feel free to check out our website for more information on these professional development opportunities. Additionally, we have seen the association advocate on behalf of student affairs on the growing emphasis of marketable skills and career development. We are thriving! 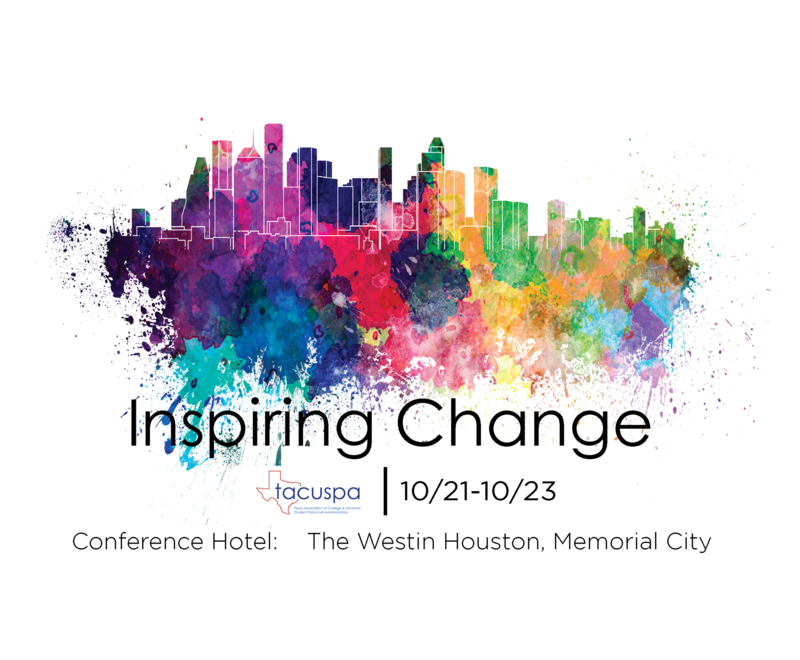 As we continue with this theme of making TACUSPA bigger and better into the future, we will look to next year’s conference theme of “Inspiring Change.” As we all know, change is a part of our daily routine, and as an association, we will look to provide resources and programs that enable you to inspire change in the things that matter. On behalf of the TACUSPA Foundation, we wish to thank all those that supported the Foundation this past year! To date, we have raised approximately $10,960. For those who may still be interested in making a contribution, it’s never too late. Simply click on this link and make your tax deductible donation: http://tacuspa.net/Donation_Sponsorships. This year, we introduced the “txt2give” feature which allowed individuals to donate to the Foundation “on the go.” We apologize for the technical difficulties that some experienced and assure you that we will have all that figured out in time for the next conference. Additionally, we gave conference participants the opportunity to purchase raffle tickets for items that were featured as part of the Silent Auction. Congratulations to this year’s winners: Autographed Cowboys Football – Matt Grief, Harry Potter Collection – David Gehrels and the Kendra Scott Jewelry – Edna Dominquez. Donations to the Foundation included: Cash Donations = $5772; Silent Auction = $3028; Golf Tournament = $420; txt2give = $1211; raffle = $530. We also want to thank those who donated items for the silent auction. The Foundation’s efforts to support the Thomas Moorman Fellowship Program and Graduate Student scholarships would not be possible without your contributions. Again, we thank you! You may now get a head start on 2018 memberships which will be effective from January 1 through December 31. Benefits of membership include reduced conference registration fees, a variety of volunteer opportunities, webinars on current and relevant topics, access to online job postings, and networking opportunities with colleagues from across the state in a wide range of professional responsibilities. Professional Memberships are $35; Student Memberships are $20; Emeritus Memberships are $50 one-time fee; Institutional Memberships offer a discounted rate per individual when renewed as a group. To renew your Individual Membership login at www.TACUSPA.net to update your account; to renew your Institutional Membership visit http://www.tacuspa.net/institutional. Feel free to email Hope.Garcia@unt.edu with any questions about the membership renewal process. This December we wanted to try something a bit different and offer you a webinar that you can view at your own time. We hope that you enjoy! Hazing is a bizarre and sometimes deadly safety problem on campuses nationwide. Rigorous safeguards are needed to prevent occurrences and to keep a persistent culture of hazing from taking hold at an institution. Like sexual assault, hazing can be a problem particularly troublesome in fraternities and sports teams, as it often flares up in organizations considered to have high status on campus. Moreover, campus professionals combat hazing in ways that are far too lenient for the felony or misdemeanor crimes that can result from increased alcohol levels, sexual assaults or other activities. When college athletic teams engage in hazing, about a quarter of all coaches is aware of the problem, but often do not step in to stop the practice until parents become aware of the practice and raise the issue. By then, prevention is too late. Simply stated, hazing is a menace unlikely to evaporate on its own. Once campuses learn of the presence of hazing at one social group or team, chances are a culture of hazing is already present. At this point the hazard must be addressed by campus law officers, administrators and chapter advisers. •Teach your students how to conduct positive rites of passage. •Help professionals intervene when hazing is present. •Understand the seriousness of hazing and the consequences that should follow such acts. •Know when it is necessary to involve outside law enforcement about a possible criminal hazing incident. Paul York is the Associate Dean of Student Affairs and Deputy Title IX Coordinator at Texas A&M University-Central Texas and has been at A&M-Central Texas since 2013. 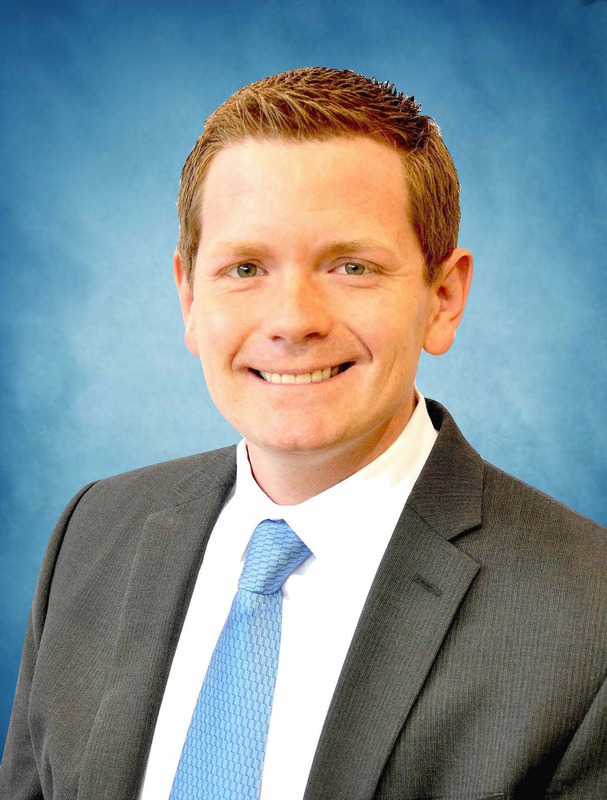 Paul became a member of TACUSPA as soon as he moved to Texas and has seen it as an invaluable resource ever since. Currently, Paul is serving as one of the co-chairs for the 2018 annual conference in Houston. He and his husband, Justin, are the parents of a 10-month-old labradoodle, Klaus, and they are on the adoption and surrogacy journey as they begin to build their family. When I arrived in 2013, I quickly learned how amazing TACUSPA is and the importance of the relationships and support I can build through the organization. There are so many incredible professionals and graduate students from whom I get to learn a plethora of ways of reimagining a conversation, a relationship, or problem that I’m facing. Coming to Texas was scary for me. I spent 7 years at Indiana University where I never felt out of place for being gay and then another 6 years at a very welcoming private institution in Colorado where I was also accepted and loved. Texas was always this unwelcoming desert in my head. When I arrived, I got to quickly interact with some members from TACUSPA who helped me feel more settled and welcome in my new home. TACUSPA became an integral part of my support network. I would be nowhere near the professional I am today if I did not have TACUSPA. I can honestly say that I have never been a part of an organization where I felt like I was getting so much or felt so responsible to try and give something back, even if it pales in comparison to what it gives me. Over the next year I have the opportunity to work with Jamal Smith at SFA to build a conference that will provide all of us an opportunity to engage and learn from one another. I am so honored to be able to serve the organization in this capacity. The official website of TACUSPA is tacupsa.net and the official email of TACUSPA is tacupsa@tacuspa.net. Should you receive notifications that appear to be from TACUSPA but are from other domains (i.e., tacuspa.com or tacuspa.org), please disregard and set your spam settings to stop them from contacting you, as TACUSPA does not own those domains. 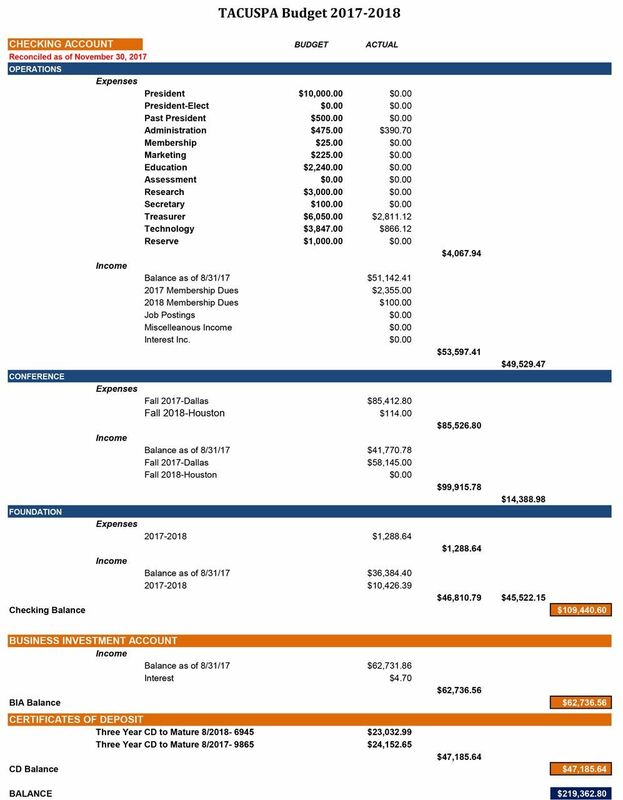 TACUSPA is a professional organization and will not solicit you. Save the Date for the 2018 TACUSPA Fall Conference! The conference will be held in Houston, TX at the Westin Houston, Memorial City hotel on October 21-23, 2018. We hope to see you there! For this newsletter, we are sharing insights from Southern Methodist University (SMU) that we hope you will find interesting and inspiring for the work on your campus. And thanks goes to Adam Cebulski for this contribution. If you have something to share please feel free to email pshefman@central.uh.edu to be featured in a future assessment corner. At Southern Methodist University (SMU) the staff within the Division of Student Affairs are not only practitioners but are viewed as researchers and educators who help students learn in formal and informal ways. With that we have developed a more robust culture of assessment and accountability. With an increased focus on outcome tracking at SMU and within the field of student affairs, our division embarked on a project to develop departmental strategic and assessment plans that closely align with the SMU Second Century Strategic Plan. We are in the final stages of developing a new division-level strategic plan. When that is complete, departmental plans will map to divisional goals, objectives, and learning domains. Each department within the Division of Student Affairs will also be required to develop a comprehensive assessment plan with goals and outcomes addressing programs, services, or initiatives is support the university’s strategic plan or receiving university-level support, signature programs/services, and initiative from the Office of the Vice President. For each outcome a department creates, they must identify which domain (cognitive, affective, or psychomotor) the learning outcome stems from and to what level within that domain they are trying to reach or what change or growth they’re looking for in students after the program occurs. I work with each department to ensure they have an appropriate distribution of outcomes over the different domains and that they are providing learning opportunities at all levels of mastery. These are all then mapped at the division level to give a higher-level picture of learning across our departments. By being intentional and strategic about how we design learning environments in our departments, we remain committed to educating the whole student and every student at SMU, regardless of their background or experiences. The 2017 Conference was a BIG success! 275 colleagues from across the state came together in the BIG D to have BIG conversations on BIG topics. The Conference keynotes Derrick Carpenter, Dr. Mamta Accapadi and Dr. Matt Gregory challenged us to think BIG and move the needle forward. Each of you took time to step outside of the proverbial box and engaged with TACUSPA, the Foundation and one another in new and exciting formats. Thanks for taking time to make donations to the Foundation, bid on items in the silent auction, and visit with our amazing conference sponsors. We hope the photos below remind you of all the fun we had together and encourage you to join us in 2018!